I've been dreading this day for some time, even though I knew it was coming. And now it has. On November 4, 2014, Harry Pearson, the founder of this magazine and the finest and most influential writer in our field, passed away in his home at Sea Cliff—and with him goes the very last of a thrilling, now-distant era when the high end was young, and so were we. Let me be honest: I haven't spoken to HP since the day he quit the magazine (August 31, 2012), when I called him one final time to beg him to reconsider his decision, not so much for TAS' sake (because, to be honest, Harry hadn't been a key contributor to our pages for some time) but for his own well-being and financial security. It did no good, not that I expected it would. HP had had a heart attack several months before, and as life crises tend to do it led him to reconsider the path he'd been taking and would be taking in the time left to him. To be frank, he was frustrated about the way things had gone at the magazine, which he'd created and for many decades single-handedly run, and was now set on recovering his glory days by starting anew. Nothing I could say about how quixotic such an enterprise might prove to be at his age, when his health, stamina, and concentration weren't what they once had been, could dissuade him. That chutzpah (there is no better word for it) and utter, unshaken, and unshakeable self-confidence were hallmarks of Harry Pearson from the start. His courage and confidence and talent were what had led him from a tough childhood in the South to Duke University and thence to Newsday magazine, where his environmental reporting (he was among the very first to report on this now much-reported-on subject) earned him a Pulitzer Prize nomination. And, as all of you old hands already know, it was that selfsame audacity and self-confidence that led him (and his friend and fellow audiophile John W. Cooledge) to launch The Absolute Sound in the spring of 1973, going against the odds and the advice of his friends and colleagues at Newsday, who to a man warned him that a magazine was a money pit into which he would soon sink every penny he'd socked away. Harry, being Harry, paid them just enough heed to limit his losses—and then went right ahead. With 500 to 1500 readers tops at two dollars of revenue per head per issue on a four-issue yearly subscription, HP calculated that he could afford to "float" the magazine on his own dime for a single year, and, when the inevitable occurred, eat whatever debt was left and, in his own words, "live to tell the tale." But a funny thing happened to Harry on his way to the poorhouse. After taking out an ad in Audio magazine's classified pages, he found himself knee-deep in subscription requests—in numbers that went way beyond his wildest expectations. Within a short time, TAS became so improbably successful that HP was able to quit his "day job" at Newsday and devote himself full-time to his lifelong passions, audio and music. To paraphrase Max Bialystock, "Where did he go right?" Well, he picked the right moment, for one thing. The timing couldn't have been better for a subjectivist audio magazine. Whether it was good fortune or editorial genius or a little of each, TAS' founding coincided with a sea change in the market. With the sun setting on the Golden Age of Hi-Fi, small companies founded by brilliant iconoclastic engineers as attuned to sonic realism and as uncompromising as Harry himself had begun to proliferate, and almost all of them found their first home in the pages of The Absolute Sound. With a few long-lived exceptions like Quad, KEF, Ortofon, and McIntosh, most of the marques that we consider old standbys today were newcomers then—so many of them in such rapid succession, from so many talented individuals around the country and the world, that this revolution in hi-fi acquired a new name, the "high end," to distinguish its sonic aspirations, listener appeal, and, yes, often higher price tags from the mass-market goods of mid-fi. 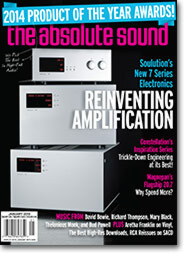 While it would be an overstatement to say that TAS created high-end audio, it was certainly indispensable to ushering it in—weeding out the pretenders from the keepers by comparing both to the ideal of the absolute sound, creating a market of its own readership for products that excelled in this comparative test, and making audio seem exciting again by injecting wit, no-nonsense judgment, and a clubby sense of exclusivity—of those-in-the-know and those-not—into the once-technocratic world of audiophilia. Pearson and company made audio gear more exciting by talking about it in plain English rather than via circuit diagrams or mathematical formulae, by creating a vocabulary and a standard of comparison that "ordinary" music lovers could relate to and make use of, and by calling a spade a spade when it came to good, better, and best. While being the first on the scene to report on a new, rapidly evolving market that was itself attuned to the idealistic/subjectivist aesthetic of the magazine was certainly a key advantage, it wasn't just the market that was new. The magazine's boomer-generation readership was, too. In the Fifties, listening to records in Dad's house had been a joy, a solace, a shared form of discovery and education, a display of status, and (for teenagers) a tool of seduction, but by the late Sixties all those threads had been woven into something like an ecstatic communal rite. The decade is almost unimaginable without the rock music it is famous for; the protest movements, the sexual revolution, Flower Power, pot, even the Vietnam War—the other things the Sixties are famous for—still live for us in song, as if the entire wild, rebellious, besotted era had been scored for a rock 'n' roll movie. If you lived through the Sixties, you didn't just want to have a nice stereo in your pad; you had to have one. It was your connection to the world at large and the worlds within that world. Although Harry was anything but a rock 'n' roller, by dint of his idealism, his anti-establishmentarianism, his cranky candor, his unerring nose for the new and promising, and, once again, his superb timing, he tapped directly into this zeitgeist. For a whole lot of us he and his magazine became the prime guide and connection to this new, non-mainstream landscape of "high-end" audio, and the new, non-mainstream music it brought to life. Of course, Harry's magazine (journal, actually) wasn't intended for penniless, bedraggled scum like me—it was meant for the respectable hi-fi nut, not the hippie hi-fi nut. It was, quite self-consciously (and sometimes off-puttingly), a members-only club made up of old-timers from the hi-fi era (like Harry himself), married to the best reproduction of acoustic music, and FNGs from the Sixties and Seventies, who, just out of college, were on their way up and wanted that rock soundtrack to accompany their climb. But there was something else going on with TAS in addition to "me generation" conspicuous consumption—something tied just as closely to Sixties idealism and experimentation as the explosion of "high-end" products from brand-new or little-known companies, many of them started quite literally in garages—which connected directly to the don't-trust-anyone-over-thirty iconoclasm of early boomer culture. Prior to The Absolute Sound, most of us depended on the numbers published in mainstream audio magazines to form our opinions of which hi-fi gear looked worthiest of purchase. The better the numbers, the more appealing the product. Even though readers hungered for plain-English opinions about the way things actually sounded in real rooms with real sources, such opinions were seldom voiced in Audio or High Fidelity or Stereo Review, lest a negative review upset advertisers. It was Harry Pearson who changed this vaguely cynical, entirely relativistic, basically commercial paradigm, who made the "absolute-sound" standard—the sound of actual acoustic instruments playing in a real space—the new benchmark for judging the sound of gear and the sound of recordings. Using real music as a basis of comparison wasn't Harry's invention. Acoustic Research, for one, produced "live-versus-recorded" exhibits on an occasional basis throughout the Fifties. But with Harry, the occasional became the absolute. The only reliable metric was how close reproduced music came to the real thing; the only reliable measuring device was the human ear. In time, something like an extended family formed around the magazine—a family that those of us alienated from the establishment by the Sixties embraced wholeheartedly. The absolute sound was something you could believe in without a penalty in dashed hopes; it was a community you could belong to even if you couldn't afford the initiation fee. Issues of the magazine were passed around like pages of the gospels; opinions were voiced about products heard, unheard, and never to be heard; cliques formed around certain products and certain reviewers who championed those products; a new high-end normal began to coalesce, replacing the old hi-fi one; and it was all incredibly exciting and incredibly fun. And then, of course, there was the charisma of HP himself. As a protégé, it is tough for me to be objective about my old mentor. As a friend, Harry was…difficult. Vain, flighty, lazy, self-indulgent to an extreme, and prone to gossip and, sometimes, to malicious mischief, he was also charming, worldly, knowledgeable, funny, gifted, insightful, and, often, loyal to a fault. As a human being Harry Pearson may have been a mixed bag—who isn't?—but as "HP," the legendary journalist and thinker and magazine publisher, he is beyond criticism or complaint. Harry Pearson is unquestionably the most important, the most entertaining, and the most influential writer about all things audio this world has seen—or will see. He not only had a golden ear; he had a brilliant mind, for, as he himself said to me when I complimented him on the acuity of his hearing, it wasn't the way he heard equipment but the way he thought about what he heard that made him such a terrific critic. That and his writing style, of course, with its Johnsonian complexity and gravitas—and its flashes of Pauline Kael-like (a writer he admired) snarkiness and wit. It is not often that you can say of someone you know that he changed things. Within our little subculture of audio-crazed music lovers, Harry Pearson did just that—and not only for the people who actually met him but for the vast audience to whom he was a near-mythical figure. Harry had that rare writerly gift of making you feel as if you knew him, whether you did or didn't—that what he had to say was worth hearing because he was worth listening to, because it was coming from him. I'm going to close this eulogy with a story that I've already told about how I met Harry—and then with one that I haven't told about how we said farewell. Soon after my book on RCA recordings came out back in 1993, I got a cold call from HP. (I never did find out how he got my number, which was unlisted.) Even though I'd written ten (soon to be eleven) novels I was a bit in awe—I'd been reading HP since I was a kid and actually hearing that deep, rumbling voice of his for the first time, and out of the blue, was disconcerting. "I feel like I'm talking to God," I blurted out. There was a pause and then HP replied, "No, God is talking to you." As I said when I originally penned this anecdote (and as I feel just as keenly today in light of his passing), that is the way I'll always think of him. Despite the ups and downs, Harry Pearson has been an overarching presence in my career since the day I got that phone call. Even after his resignation from TAS, and now his passing, he will remain an abiding presence. HP was one of those rare "bigger-than-life" characters, who had the sheer force of personality to change your life. And so he did mine. As for the goodbye. After that phone call two years ago in which I tried to persuade Harry not to leave TAS, he called me back. "I want you to know that I think of you as a friend," he said. "You've been a worthy colleague and, at times, a noble adversary." I told him how much he had meant to me in words I'm not going to print here. And that was the last time we spoke. I never talked to or saw Harry again. I wish I had. I wish he were still here. I'm sure all of you reading this do, as well. Rest in peace, HP. We will not see your like again. We have created a Wall of Remembrance for Harry at The Absolute Sound for readers and the industry to share their HP stories and memories.